Saturday May 18, 6:30 p.m. 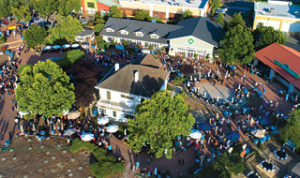 The 2019 Jubilee will offer ticketholders a “wine country casual” experience, as they stroll about the Harbison Event Center, sampling some of the area’s best foods and award-winning wines and beers, while enjoying musical entertainment provided by special guests, and a Silent Auction. When the tasting portion of the evening concludes around 9 p.m., ticketholders move over to the Nut Tree Pavilion area, to enjoy rides on the Nut Tree train and carousel, and dance to one of the area’s most popular bands, The Time Bandits. This year’s top prize in the Jubilee Raffle is either a $15,000 Dream Vacation, provided by Wasserman Travel — in memory of Wendy Wasserman-Kellogg, former NorthBay Healthcare Foundation board member — or $15,000 in cash. In addition to the dream vacation, there is a Tribute Prize this year: A private tour of Pixar Animation Studios in honor of Adam Burke, former Foundation board member. Another $10,000 in cash will also be awarded, according to Jim Kellogg, raffle chair. Raffle tickets are $35 each or three for $100, and can be purchased by calling (707) 646-3133. All proceeds from this year’s raffle will benefit NorthBay Hospice’s Dream of a Lifetime program, a wish-granting project for adult hospice patients. The Jubilee’s Presenting Sponsors are Al and Patt Shaw, Dr. Lee and Valerie Freeman, Dennis and Alex Landis, DPR Construction, Western Health Advantage, Heidi Y. Campini, Paradise Valley Estates and Before The Movie. Tickets, for those aged 21 and older, are $100, or $125 on the day of the event, if not sold out. For more information, go to www.northbayc2c.org.